Beautifully written, artfully done. Thanks be to Jesus who can bind us up, and heal us every where we hurt. I would love to purchase a copy of that print. Do you sell your work? Oh yes, and you know Wendy, it’s only because of Him that I have experienced soooooo much healing in my life. Not psychologists. Not other therapists. But God, through Jesus. Oh wow! Really? I’m honoured that you would actually want to purchase a copy of this. Thank you so much. I’m truly amazed. I have never sold any of my art pieces, nor have tried to. I have thought of writing and art and devotion book once with poetry, art and short devotional, but haven’t had time to do so yet. I would love to you this via email and you could go get it printed out if you like. Really no problem at all. I would love to bless you with it. Have a great Thursday Wendy and thanks again. Oh yes, I totally agree! Because I was scarred from my childhood, and didn’t get help in time, I scarred my children. I’m praying to God that it doesn’t get carried into my grandchildren. You and me both, my friend. Severely scarred. It took me years to get over all the junk in my life. I’m so sorry to hear that you scarred your children as well. But you know, our God is a God of reconciliation. Don’t lose hope Melinda. Miracles happen. I have young children, and I’ve had a tough time at times. One thing I always make sure I do is ask for forgiveness, say sorry and tell them what I did was wrong. I am growing and learning, and I hope and pray that they grow up health and whole and secure in who they are in God and who they are within our family unity. Thank you so much for sharing. Many blessings on you and your family. Thank you so much, Staci. I have asked them both for forgiveness. And I pray every day for them. They are both healthy, thank God. Thanks for being so sensitive. Oh that’s great. Reconciliation is a beautiful thing. Have a great weekend Melinda. p.s. now don’t you go eating too many of those pudding pops ok. Hahahaha. Beautiful art and poem. I agree that without God there is not much hope for someone wounded deeply as a child. With God all things are possible, including being completely healed and let out of that cage. Thank you so much Teresa. I totally agree. I had a lot of junk in my life that I needed healing from, and it was only God that was able to bring me through it. I believe that I am one that has flown out of the cage. We are so fortunate to have a Father who loves us, a Saviour who sticks closer than a brother, and his Spirit to teach, comfort and counsel us. Thanks for being you! Love your thoughts. Totally fortunate. Thank you so much Rob for your comment and encouragement. Beautiful poem indeed, the analogy of onion…caged girl, her eyes are the windows to her soul, brilliantly captured thoughts and wonderful weaving of words. Ohhhhh thank you so much Nihar. I’m so glad you liked this one. Yes, childhood is so very delicate and a time of formation. We must, but must not take the raising of children lightly, nor flippantly. I’m sure it’s probably Friday for you now. Soooooo, I wish you a very happy weekend. I’m off to your blog now to read your latest post. Children and childhood are precious moments…needs to be protected and nurtured. Awwww, thank you so much Trini. You are so sweet. Oh yes, going through the fire. I never thought of that story in that way before. Interesting observation. I also believe that radical healing is possible. It’s happened in my life. It was tough and took time, but it really did happen. Thank Trini and take care. I’m fortunate that I was not scarred in my childhood, at least not from my parents. There is nothing more important to me than the welfare of my children. I can’t imagine doing or saying things to them that would scar them emotionally, and it breaks my heart that there are so many children who are being scarred right now. You are fortunate Rob. And I’m so glad you weren’t. There’s nothing more important to me either. I want them to have the childhood and youth that I never had. I want them to grow up healthy and whole in every way. And it’s true. There are sooooo many children who are being scarred. So, so sad. Hope you’re having a good day. How are things going on the work front? Yes, I am very fortunate it some respects. Work is ok, and it’s eerily quiet on the labor talks. I don’t know what to make of it. So you are not on strike yet? LOVE, LOVE, LOVE this one Staci. My favorite line is “She’ll see her colors.” I lived most of my life in black and white – everything greyed out from struggling with depression. It wasn’t until I asked Jesus into my life that I began to see things in color. The hardest part for me has been for me to see the beautiful colors that He put inside of me. Colors meant to be shared with others. 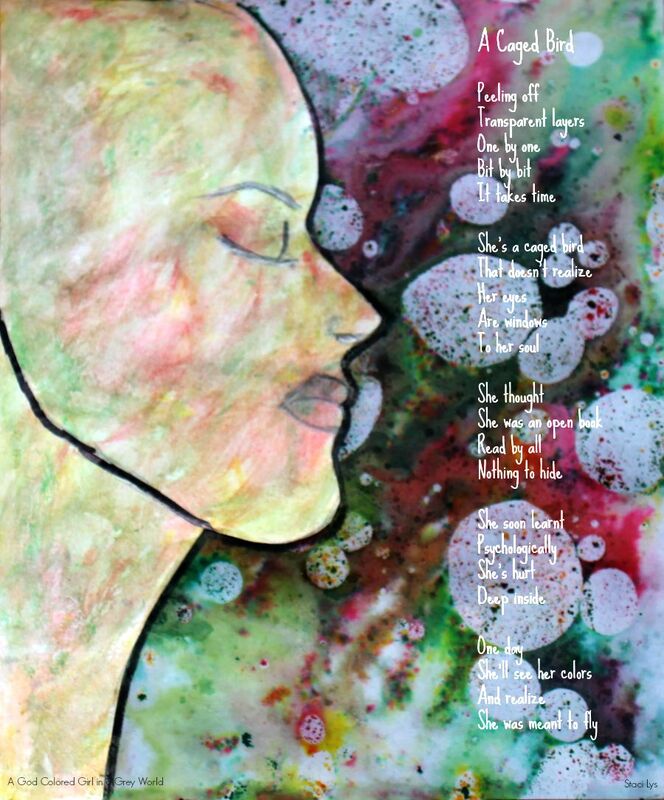 This is simply beautiful words and artwork, Staci! Hey are we still on for tonight? Awwww, thanks Kirsten. Wow! ‘LOVE’ in capital letters? I’m honoured that you do. Hope you’re having a great day K.
Ahhhhh, what a great line, ‘bathed in color’. Love it Kirsten. And yes, I totally think it’s AMAZING being bathed in color. Yes, I’ve found a good amount of it. some of it is still hiding on me though. Hahahahaha. My son has been saying these past couple of days, ‘Mommy, your voice is back?’ And I keep telling him, ‘Yes Cauê, it’s almost back.’ hahahahaha. He’s so funny. I’ll have to show you him when we Skype. I’ll just take my laptop into his room so you can see him sleeping. He’s soooooooooo cute. Hi Staci, I couldn’t agree more with your words. Have a great evening! So glad you do Elizabeth. Have a great weekend. Your poem is beautiful, Staci, and I can completely relate to her. I have a parent who had a horrible childhood. Eventually things turned around but the damage was done. Unfortunately, he’s damaged and he damaged his children. I’ve worked hard to understand and forgive which was what I needed to do to get well. It’s been worth the hard work…and there’s always more to learn. Of four kids my brother is the only parent – only 1 grandchild – and he’s done a great job. Have a wonderful weekend, my friend. Thank you Geralyn. Oh yes, unfortunately too many people can relate to her. I had a horrible upbringing with my dad. I lived in fear and was full of anxiety. It stuck with me well into my adult years. I have undergone an immense amount of healing, and am so thankful to be where I am today. I am doing everything I can to make sure my kiddies grow up healthy and secure in who they are. Thank you so much for sharing your experience. You also have a great weekend. Make sure you get outdoors and take advantage of what’s left of the summer ok. I will definitely check out your blog, and thanks for telling me about it and for stopping by here. Awwwwww Zee, thank you so much. I am soooooo happy that the words touched your heart, and that you were able to relate to them in a personal way. I’m also happy that you were able to recognize that you are not alone, but there are others that have the same feelings and difficulties. Thank you so much also for your generous appreciation of my art. A gallery? Really? Maybe I’ll make a virtual one on my blog. Thanks again Zee. You have truly blessed me with your comment and I sooooo appreciate you. Oh yes, that’d be such a great idea you know ! To have a virtual gallery on your blog of all your artwork, so cool !! I am soooooo blessed by your comment Zee. You are so kind and sweet with your words. Thank you so much. I really must look into a virtual gallery. That would be cool. Huge hugs to you sweetie. Awwwww, thank you so much Lorrie. You are so sweet. I think I’ve become addicted to learning about all the different mixed media techniques and all. Thank you so much for the kind compliment. I really want to do ‘intentional art’ and that’s why I always have a message to go along with it. Much love to you, my friend, and please have an amazing week. Thank you so much Indah. I’m so glad you like this. And yes, childhood is so very important. They are the formative years. Years that will establish a person’s values and character. I would say that’s a huge responsibility for parents eh. Have a wonderful week Indah. Staci, “A Caged Bird” is a lovely poem and the artwork is beautiful. Your words always inspire deep thought, and the topics are ones that require much soul searching. I wonder if we ever stop being a child in some regard, while we continue to grow. Please take good care and have a wonderful week. Thank you so much Pepperanne. And you know, I think there is always some bit of ‘childhood’ within is. We may grow harder as we grow older, thanks to life experience in a cold and harsh world, but I think we always have wonder and curiosity. You also have a wonderful week and take good care. Hahaha. It’s a normal mistake. Many have done it. lol. Thanks you so much Neha. I’m so glad you don’t know what it is like to be wounded like this. I don’t wish it on anyone. I definitely agree that childhood is a important time in one’s life–I wish all parents realized this. I have seen in myself (as well as others) how the negative things that one experiences (or the lack of support) one has in childhood can shape how one navigates and responds to the world as an adult. I really feel that your poem brings encouragement for one to break free from the negativity of their past. Thank you so much Crystal. I’ve also seen this in myself. With wide open eyes. I can really relate to this piece. That is a gorgeous poem––love it! I completely agree with you. Words are powerful and can inspire someone to be great or compel them to take their own life. A child is especially vulnerable. Thank you so much Vashti. I’m so glad you like this poem. Whoever said, “Sticks and stones may break my bones, but names will never hurt me” had it totally wrong. Hi stacilys, this is wonderful. The whole article, words and the art – they are in perfect sync. Loved it. Hi Anoop, so nice to meet you. Thank you so much for your encouraging words and for appreciating my work. I’m so glad you ‘loved’ it. I will have to read your article. Thanks for sharing it with me. I am soooooo sorry it’s taken me so long to reply. It’s because I was traveling and then I after getting back, there was a huge workshop happening here. Thank you so much. I’m so glad you like this, and some of my other stuff. I’m on my way over now to check out your blog. Hope the workshop went well! It went great, thanks. New vision was sparked. Gotta love that. This is beautiful! Childhood should be a wonderful time filled with pleasant memories and it hurts to See that isn’t the case for so many people. Ameena, thank you so much. And yes, I agree. Childhood should be a time of joy, wonder, learning, affection. Unfortunately that isn’t the reality of far too many children. Myself included.